Got your tickets? Don't forget to book your parking in advance. Summerfest lots are closer to the entrance than any other lot. Summerfest 2019 will be open Wednesday, June 26 - Sunday, June 30 and Tuesday, July 2 - Sunday, July 7 (Closed July 1) from Noon to Midnight. Parking lots open daily at 9:00 am. There is no RV parking on the Summerfest grounds. 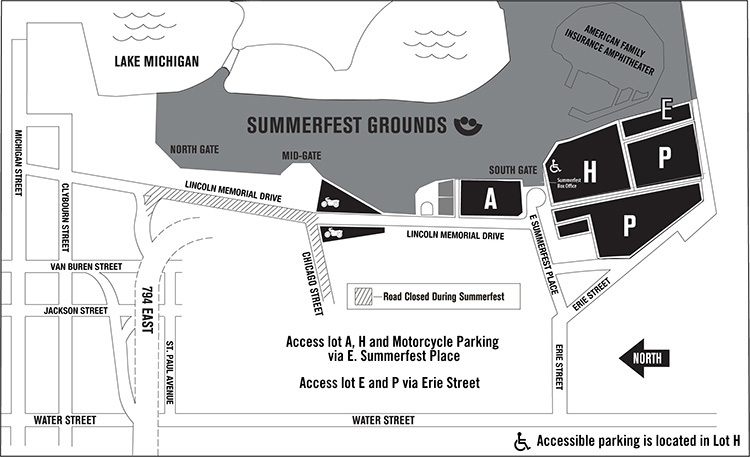 If you are parking at Summerfest for a show at the American Family Insurance Amphitheater, please plan enough time to navigate traffic and park. Valid only on Tuesday July 2, 2019 for parking in Lot P. One entrance, one time to the Lot. This is NOT a Summerfest admission ticket. This ticket can be printed at home or scanned from your mobile device if the ticket has been downloaded to your phone.